Of all the stories and reports related to supernatural or paranormal phenomena, the largest number by far originate during use of Ouija Boards. The term "Ouija" is owned by Parker Brothers, who market the board as a game and offer no explanation as to how it works, though one early brochure said it may have to do with inner-consciousness. Parker is not the only one who markets talking boards, however, and indeed, a workable rendition of this interesting medium can be made at home using ordinary materials. Talking boards in various forms have been used for thousands of years in attempts to contact spirit entities. During World War II, sales went through the roof as people attempted to communicate with lost friends and relatives. 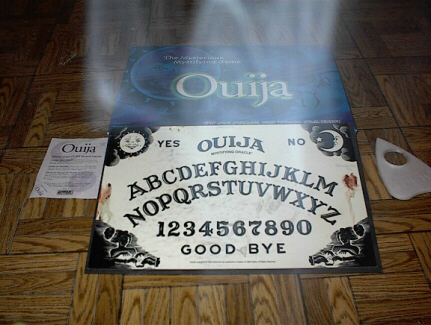 A poll conducted on teenagers in 1994 indicated that Ouija Boards were second only to Monopoly in board game popularity. Virtually everyone has a personal story about something eerie (and often frightening) happening while in the process of using Ouija Boards, which suggests that this is something a little more complicated than a store-bought board game for entertainment, and that it may even be dangerous when used incorrectly. "During the last 20-25 years I have had considerable personal experience with persons who have complicated their lives through dabbling with the Ouija board. Out of every hundred such cases, at least 95 are worse off for the experience. . . .I know of broken homes, estranged families, and even suicides that can be traced directly to this source..."
Obviously, many of us have used Ouija boards without serious ill effects, but the real problem is that once you pick up that board and start trying to conjure up spirits, the outcome becomes very uncertain. Ouija boards are a form of Channeling, and factors that may have an impact on individuals include mental stability, ingrained belief systems, strength of personality, etc. Because we do not know what is actually taking possession of that planchette, or how this process really works, we could be opening doorways for the bad entities as well as the good. For instance, if we pick up a Ouija Board and try to contact Elvis, and we really believe that we are talking to Elvis, we will be much more vulnerable to manipulation and possibly even possession by the entity who has come through that opened doorway - who is very likely not Elvis at all. As suggested in the Parker Brother's brochure, the mainstream theory regarding use of Ouija boards is that it is the subconscious of one or more of the participants making the planchette move. This is likely often the case - but not always. Several tests done by competent researchers have revealed that the planchette moved to spell out words at very high speeds in some sessions during which the participants were blindfolded. Other indications that it may be something more include many reports of physical changes in the vicinity of the Ouija board usage, such as objects moving, lights flashing, sudden temperature changes, and even the planchette moving by itself. Although nobody really knows for sure what happens during Ouija Board usage, what seems clear is that when used by stable individuals for the right reasons, Ouija Boards are probably the best medium that exists for making contact with supernatural presences. Many of our leading mediums and psychics started their careers using this very technique. Please see the link below for practical tips to help make your Ouija board experience a good one and to help you avoid common and potentially disastrous pitfalls. As always, if you have a particularly interesting story to tell about using a Ouija Board, we are very interested in hearing it. Please post to the Message Board below, or send us a private email, and we will be thrilled to discuss it with you. Don't forget to Bookmark, as we add new material to this site daily.